Dumela! 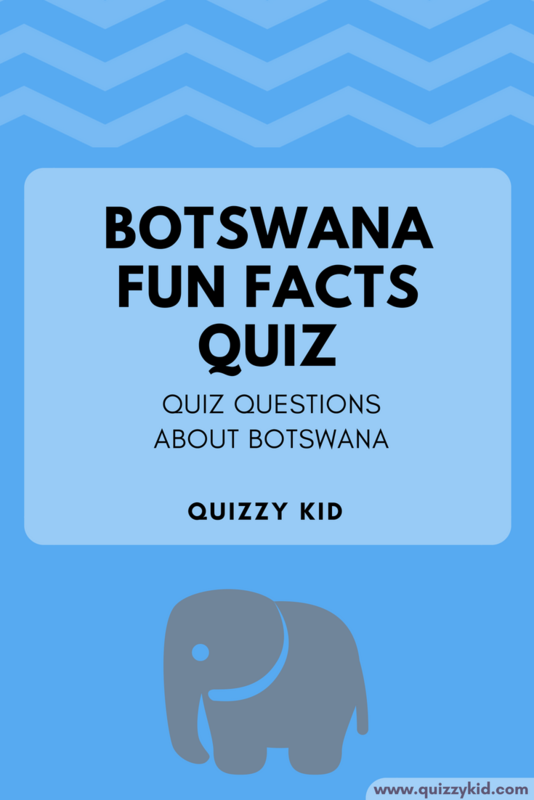 Do you know lots of interesting facts about Botswana? This quiz has fun facts about the beautiful African country. Maybe you've been to Botswana or it's somewhere you'd love to visit. Come and try your luck with our 10 free quiz questions. If you're looking for printable quiz pdf then we have a 20 question quiz pack for you too! If you're looking for more geography quizzes then check out our Fiji quiz or Costa Rica quiz! Q1. Botswana has no coastline: True or False? True. Botswana is a landlocked country. Q2. What is the official language of Botswana? Q4. What is the capital city called? Q5. Which country did Botswana gain independence from in 1966? Q6. What is the most popular sport? Q7. What animal is on Botswana's coat of arms? Q8. What country is south of Botswana? Q9. Which desert covers up to 70% of the country? Q10. What religion do the majority of locals practice?